Do you find yourself continually racing against time? Do you feel that you have so much to do that it’s difficult to get anything done? Laura Stack is a personal productivity expert, and she can show you how to create a time management system that works for you. Managing time effectively is the key to managing your individual performance, but it’s much more complicated today than making a list and checking things off. Learn how to set priorities and focus on what’s truly important, plan and schedule your day, and manage your calendar and tasks. Get organized, learn how to efficiently use social media, and eliminate time wasters in your day. You’ll gain scores of new ideas from Laura Stack, aka The Productivity Pro™, on increasing output without increasing effort and performing at your matchless best! This program is accompanied by a detailed self-study workbook containing exercises, checklists, tools, and templates to apply your learning as you listen in the car, on the go, or at your desk. Start getting organized today! 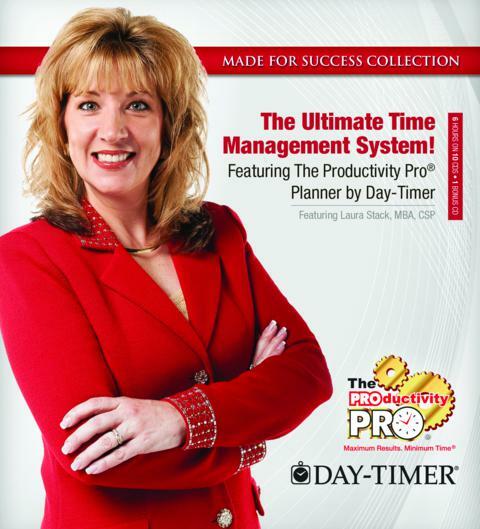 Get Laura Stack’s Ultimate Time Management System! 1.Creating a System that Works for YOU: Paper, Electronic, or Hybrid? 11.The Ultimate Time Management Workbook (PDF). LAURA STACK is a personal productivity expert, bestselling author of four books, and a professional speaker whose mission is to build high-performance productivity cultures in organizations by creating Maximum Results in Minimum Time. She is the president of The Productivity Pro, Inc., a time management training firm specializing in productivity improvement in high-stress organizations and the 2011-2012 President of the National Speakers Association. Since 1992, Laura has presented keynotes and seminars on improving output, lowering stress, and saving time in today’s workplaces. Laura has been featured on the CBS Early Show, CNN, and the New York Times; her clients include Wal-Mart, Starbucks, Cisco Systems, and Bank of America.